The image was created in Mexico in the 16th century, obtained by Gov. General Juan Niño de Tabora from a parish in Acapulco, Mexico, and accompanied him on his journey to the Philippines. Later, the Jesuits obtained the statue and installed it in their church in Manila and later in Antipolo. In those days, the journey by sea between Mexico and the Philippines sometimes took between three and five years and was extremely dangerous. Pirates in the employ of other countries were attracted by the wealth of gold and merchandise sent from the New World, and the severity of the storms at sea and the clumsiness of the ships contributed to many risks taken by every sailor and owner of the vessels. 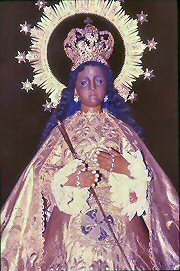 For this reason, images of Senora de Antipolo were carried on board and often called upon the title of Our Lady of Peace and Good Voyage. It was through her intercession that many sailors felt their trip was blessed and successful. During the liberation of the Philippines from Japan near the end of World War II, the cathedral was destroyed, but later rebuilt with the Virgin's image again given full honors. Antipolo is the capital of Rizal Province and daily attracts pilgrims and tourists alike from neighboring Metro Manila. 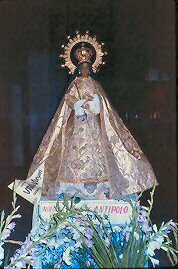 The feast day of Our Lady of Antipolo is celebrated in the town of Antipolo on December 8th, the Feast of the Immaculate Conception. A special chapel in the Shrine of the Basilica of the Immaculate Conception in Washington, D.C. contains an exact replica of the her image and is visited by many of her devotees daily.